The spring brings life to your landscape and your pond should be ready. Our Spring Clean outs will ensure your pond is clean and ready for another season. 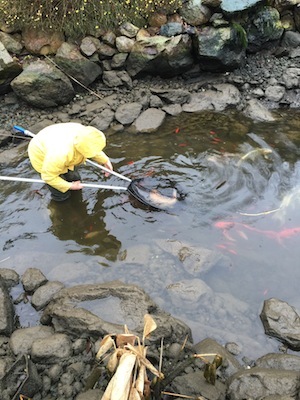 Your fish are safely removed and our experienced cleaning crew will bring your pond back to life. A complete Spring Clean out starts at $600.00. Call for estimate. We provide a plant division service. Water Garden plants grow very well and can quickly take over your pond. We can divide your plants with our pots or reuse your pots. Call for pricing. We also carry Pond Treatments that can help to maintain the proper balance. The fall brings new issues to your pond and you should be ready. Many ponds are built under trees and we provide a netting service to keep debris out of the pond. We use a quality Nylon Netting and provide a custom installation to neatly cover your pond. These nets will last many years. We can install a netting system for $400.00. We will install your netting for $300.00. Large Ponds may be more. We also provide Fall Cleanings and skimmer and Bio-Falls Cleanings. Don’t forget to ask about a De-icer and aeration pump.